I thought I would send you these two photos that I took in Eastbourne in the late 60’s showing two of Midland Red’s CL3 touring coaches, these started life in 1954 as C3 class vehicles with C37C bodies by Willowbrook. 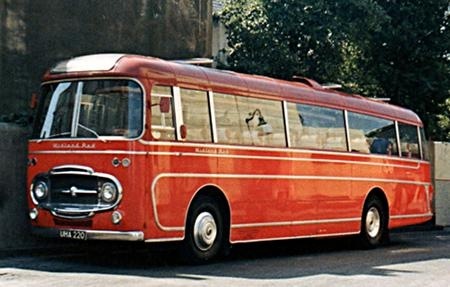 During the winter of 1961/2 sixteen of the type, from a total of I think sixty three, had their bodies removed their chassis extended and new Plaxton C36F bodies fitted they were then reclassified as CL3. They entered service in the summer of 1962 in a livery of all over pale stone colour with red being confined to the fleet name lettering but for the next season they reverted to what most people would consider to be their proper colour of red and black as shown in the photo of 4196 the only remnant of the stone being the narrow band below the windows. The other photo of 4220 taken at a later date shows a different livery with the black replaced by a insipid maroon and the stone coloured band removed which to me made them look somewhat drab as the black roof always seemed to me to be the finishing touch of class to Midland Red coaches. Dave, There was a practical reason for replacing the Black roofs, though I totally agree they finished a resplendent livery. As with the C5’s on Motorway duties it was removed for ‘passenger comfort’ – Black being a great conductor of heat ! Some of the C5 coaching stock also had a white panel (centre roof) over the later darker maroon. I have to agree that the black roof looked a lot better. What a pity it didn’t "work" in the passenger comfort department. I used to work with Architects who won design awards for their schools. Roofs leaked like sieves but they looked good. Perhaps, one day, we’ll have something that looks good and works as well: sorry, I was forgetting the all-Leyland PD2! Yes Pete, but look how long ago that was – and Colin didn’t have the benefit of computers or a PhD to help (?) him….. 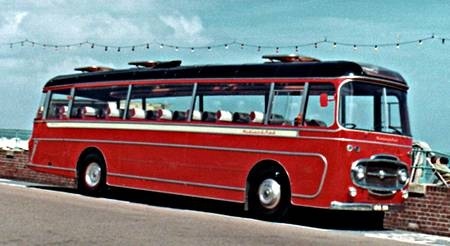 These coaches carried no name badges, although technically speaking they were, with their long windows and forced air ventilation, Panoramas. The Embassy-style grille was required to supply air to the C3’s front-mounted radiator, Similar bodies fitted to Bedford VALs were badged ‘Val’. From a (sadly) bye-gone golden age of Plaxtons. Slight correction-they were CL3s, not C3Ls. On the 19th March 2013, around 15:00 hours, an AEC Plaxton bodied coach drove up Baslow Road in Totley Sheffield (S17). It was a middle to later 1960s coach, I was so excited I forgot to take the reg no, but I recognised the style as a Panama Elite or similar. We used to go to many football matches in the 70s on these. It was driven by a lady who waved back when I gave her the thumbs up. It was full of more elderly people. Some seats were reversed to make a table type seating arrangement. I think it had table lamps. Although possibly a 53? seater, it was full but may have had not much over 30 people on board. On the boot lid it had Cheshire in large letters. How come you never have your camera when you need it. It is a 30mph zone, but was more than capable of keeping up with traffic. 4220 was based at Nuneaton garage for a while in the early 1970s. 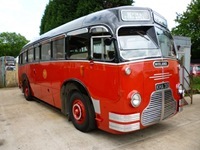 By 1972 it had been sold to a small coach operator in the Manchester area. I don’t think they knew what they were taking on… late one Saturday night we received a call from Rugby asking us to attend a breakdown at the A5/A46 junction, where a certain ex-4220 had expired while on a private hire with its new owner, to its old stomping ground. The owners claimed there was an agreement whereby they could call on Midland Red to provide backup in such an eventuality. The Rugby staff took this as fact and asked us to supply a replacement vehicle if they recovered 4220 as we were without our towing vehicle. So we attended taking LC11 Leopard coach 6243 WHA 243H and driver who conveyed the passengers home to Lancs, while 4220 was found to have a dropped valve/seized engine and was towed to Nuneaton. On the Monday there was a bit of a stink as no such agreement existed…the owners were told to bring a substantial sum for the repairs and vehicle hire, or else 4220 would not be released to them. The money paid, 4220 left, certainly in better shape than before, with new piston and cylinder head, and I never saw it again. A memorable spring day in in 1960, after driving for Midland Red for a couple of years, I was delivering a motor caravan to London at a steady 60 on the new M1 and looking in the mirror I saw what turned out to be a new C5 – Motorway Express – looming towards me and finally going past at 85+ and disappearing in a flash. The very interesting book by Steve Richards on these vehicles made note of the extensive work done by Dunlop to actually design, and the difficulty of producing, a tyre that would withstand the stress of these high speeds by a truly awesome turbocharged coach well ahead of it’s time. Still, today I would argue Roger Burdett’s beautifully restored C5 -780 GHA- is a fine example of a classic. (b) well ahead of their time. It was a sad day when "outside" suppliers had to be used. Sadly, I never experienced one of these – but I did have the Corgi toy. So did I, David, but the special Dunlop tyres couldn’t cope with Axminster carpet, but were great on lino! …..but lino did share certain (chemical) characteristics with the surface of the M1. There were no speed limits on motorways in the early days and it’s true that these and a few other modern coaches were capable of 90mph. With soft-shoulders, no central crash barrier and inadequate tyre technology, several accidents/near-misses occurred, which swiftly caused safety features and speed limits to be introduced. I think it was 80mph to start with, coming down to 70 later, to save fuel at the start of fuel crises that bedevilled countries in the 1960’s and 1970’s. The juxtaposition of this posting and the previous one, about trolley buses, is particularly noteworthy because they are flip sides of the same coin: the then irresistible dominance of the internal combustion engine. Railways were unfashionable before Beeching, being viewed as 19th century technology, (there was even a Railway Conversion League), whereas Britain’s ‘new motorways’ were seen as an exciting foretaste of new travel possibilities. 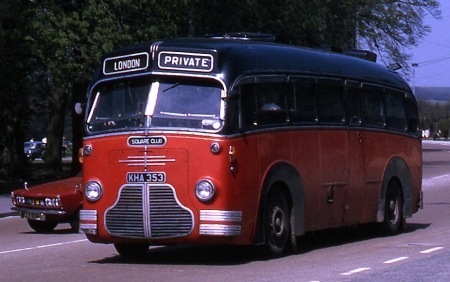 The C5 was a supreme example of this fashion, along with the Ribble/Standerwick/Scout Atlantean coaches. I never travelled on one, but, like Nigel, I remember being overtaken by one on the M1 at great speed. The fashion of the period did little for trolleys. 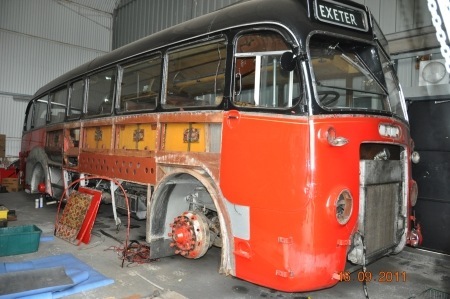 Despite the advantages in performance and silence so cherished by my friend John Whitaker and others, their need for dedicated infrastructure, extra specialist maintenance skills, additional equipment and inventory, gave the motor bus – cheaper, more flexible and by the 1950’s very reliable – an appeal that was just far more in keeping with the climate of the times. As Chris remarks, the generally high motorway speeds of the time did quickly become of concern, (not only coaches – much of the danger was caused not only by the points Chris makes but also by large speed differentials between vehicles). That led to the introduction of the 70 mph limit, (sorry, Chris, but it was never 80; 50 temporarily during the 1973/4 fuel crisis, but always 70 otherwise). In turn, that undermined the justification for ‘ton up’ coaches. Nevertheless. I still have happy memories of getting a Maidstone & District AEC Reliance up to 70 mph on the Swanley by-pass, and I’m sure all readers will admire the subject of Nigel’s lovely posting. Happy days indeed. In my student days in Birmingham, I normally travelled home on the Standerwick service to Lancaster, being overtaken almost every time by the Western SMT coaches which moved over only for vehicles showing blue lights. They were reputed – true or not? – to do the round trip of Glasgow, London, Glasgow in the shift. Another story of the time related to the prototype CM6T, which was said to have been tested over a measured mile of the then still to open M1, before Smith’s Industries in Basingstoke were contracted to make the speedometers. The beast did 120, apparently, and regularly overtook the train in that glorious section near Watford Gap Services! Following on from Pete Davies’s comments regarding the testing of these C5 – and later CM6’s – a recent extract from my May copy of ‘Omnibus’ (the monthly members sheet from BaMMOT) by John Morris, further illustrates the effort that went into testing. I hope John won’t mind me quoting verbatim from his excellent article! “At Central Works there was also a department known as ‘Development‘ which was jealously guarded from access to strangers visiting the works". As the name implied any future improvements and new designs were carried out in this area. This included the road testing of the new CM6T London to Birmingham Motorway coaches. On several occasions two young engineers, accompanied by myself would board a finished vehicle painted in green primer, without interior fittings, loaded with a number of 56Ib weights to form a second floor covering, with a large sofa placed behind the cab area (to provide luxurious comfort for the observers) and off we would go on a 1,000 mile road test. This would involve driving from Birmingham to the start of the M6 near Cannock and then going full pelt up the motorway at speeds of up to 100mph on the clock all the way to Charnock Richards services in Cumbria. I kid you not regarding the speed! Don‘t forget this was in the sixties and traffic on the M6 was very light and we simply stayed in the empty right hand lane all the way! I vividly remember drivers of sports cars probably doing 80mph looking at us open mouthed as this large green machine drifted much faster past them. I have to say that the CM5T was an absolutely splendid looking machine. The red and black livery, relieved by polished trim was really classy. The windscreen arrangement was rather reminiscent of Dutch coaches of the period. The windows may have been unfashionably small – presumably it was based on the S14/S15 body shell – but it was probably a stronger structure than the panoramic coaches that were starting to appear at the same time. Maybe not strong enough to withstand a collision at over 100mph though. I never rode on a CM5, but I did once travel from Birmingham to London on a CM6T, and must say that it was the most comfortable, smooth and quiet riding coach I have ever ridden on. The Yorkshire Traction Leopard employed on my return from the capital to Halifax came nowhere near. I also had the Corgi model (still have, and still in its box). Its suspension was also very smooth, but it lacked the chromed windscreen metalwork that gave the real thing its distinctive appearance. It was also a larger scale than the rest of my Dinky Toy bus collection, so had to be parked well away from the others in Sideboard Street Bus Station before the long journey to Coalplace via Kitchen and Garden Path. Thank you, Nigel, for your quotation from the newsletter. It confirms that at least some element of the stories circulating in my student days was correct. The run to and from Charnock Richard – it’s near Preston, by the way, not in what the political meddlers like to call Cumbria – would have given a good test of performance in "real" traffic. That was the exact route I used to operate with my Dinky Duple Roadmasters and Leyland halfcab deckers but I used to get a fair turn of speed up on the long straight Bannister Way on the route to Under Mumsbed bus station! I also had the Corgi model but never used it much because I thought it looked too big. Wish I still had it. I remember vividly as a child of about 8 yrs sitting behind the driver of a late to depart out of Nottingham Broadmarsh bus station a Barton’s Yeates bodied Bedford Val and travelling along the A52 which is a single carriageway by Wollaton Park gates at speeds in excess of 70 mph, I thought it was great but my father was quite worried for all the passengers safety as the speed limit was 40 mph ! There was another model of the CM5T made by Budgie Toys, and it was more like 1/76th scale, but I must say I never came across one in those halcyon, carefree, childhood model bus operating days – the only Budgie Toys bus I ever had bought was a Routemaster, whose wheels were just slotted onto the ends of the axles and came off every time it went round a corner. Not all they were cracked up to be, Routemasters. We’ve all been there Ronnie. I was once reported by a passenger for doing 60 in a 40 limit. 60kph = 40mph (approx.). You’d be surprised at the number of drivers who have been reported to their employers by passengers peering at the speedo’/tacho’ face and mistaking KPH for MPH. Thanks for that snippet, Ronnie. In case anyone was wondering what the difference in accuracy between a tacho and a speed camera, there was a case in one of the trade magazines about a year before I retired – so about 5 years ago now – where a truck driver had been zapped at about 35mph in a 30 zone, but his tacho said he was doing 28 at that time. In court, the Magistrate agreed to send both items for test, with the result binding. Driver was cleared and they scrapped the camera! The Val was doing 70 mph not kph as it was well before tachos were being fitted. Regarding Chris Hebbron’s comments on speed limits (27/06/12), the 70mph limit came in under Barbara Castle’s regime as Minister of Transport. After a trial period in 1965, it was made permanent in 1966 – there was no intermediate 80mph limit. The fuel related speed limits were applied in the winter of 1973/4 as a result of the combined effects of the oil shortages following the Yom Kippur War and the Miners’ Strike/3 day week. The maximum speed limit then was 50mph on all roads previously restricted to 70mph, including motorways. The introduction of the "fuel saving" limit coincided with a massive rise in prices and was widely resented. Midland Red motorway services were renowned for their high speed and comfort. There were a number of accidents but 90mph on a C5 would have been much less hairy than 60mph on the top deck of a Standerwick "Gay Hostess" Atlantean. On the 14th October 2012 during Wythall’s Midland Red day, I rode on the preserved CM6, 5656. The driver took it along the dual carriageway Wythall bypass and let her go. When I asked how fast was that, he replied ‘Off the clock, mate!’ Not bad for a 47 year old coach! Thought others might like to see the CM6T referred to by Tony Martin. Thankfully the weather didn’t spoil the "Midland Red day", great to see these restored examples at work again. On the subject of passengers reporting drivers for excess speed I well remember being approached by a male passenger who I had just seen get off one of our Bristol VRs who stated quite vehemently that he intended to report its driver for speeding because sitting in the O/S front seat on the top deck he had for some reason looked down the periscope tube and could see the speedo very clearly (which you could ) and it was reading 80 mph obviously dangerous on the road the bus was using. If only, 50 mph was a good speed for any VR, I pondered on telling him of the kph/mph scales on the speedo but decided to let him make a fool of himself knowing that the driver was able to easily prove his innocence. I agree with Nigel Edwards. In late 1959 I went from B’ham to London with my father, who was running-in a new Austin Cambridge A55 Farina (718 AOG) on the M1, bouncing along merrily at 50 to 60 mph. I was 8 yrs old and vividly remember being rapidly overtaken, and left for dead, by a big red C5MT, which was rock steady – most impressive! I have read that even after the 70 mph speed limit came into force in 1966, the coach timetable from Digbeth to Victoria, still expected the original speed of c.85 mph to be maintained on the M1/M45. Yes, I did go on to become an engineer. 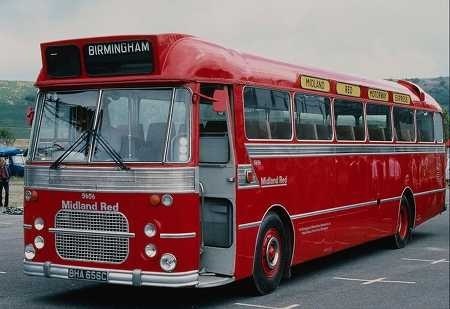 Very interested in Midland Red C5…actually drove one when I was at Worcester Garage on X72/73 Service. Also interesting to see that Mr Burdett owns one…he now owns my Tilling-Stevens, GOU 732…ex-Classic Coaches of Wombourne. It’s good to know she’s gone to a good home. 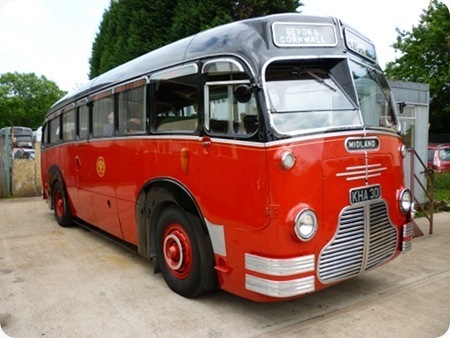 Bedford O.B., MYB 33, is now owned by Stuart Jones, Editor of Bus & Coach Buyer…another good home. Sadly the AEC narrow-bodied PLaxton, EUG?? ?D was not so lucky. John, Difficult now to comprehend, the specially selected drivers had to be trained in ‘high speed driving techniques’ and never needed to resort to flashing light intimidation – the other motorway drivers (and truck drivers) saw them coming and just pulled over. What a joy to drive these coaches then, compare with today – second lane and lucky to achieve 55mph !! Now in my dotage I have been remembering some of the things when! I drove on the Midland Red late 60s early 70s out of Banbury Garage where we had a couple of C5s an ideal tool for the rural routes around North Oxfordshire, the only alteration to their Motorway work was that 5th gear was blanked off but still they had a good turn of speed in 4th! They were beautifully softly sprung and when my sister was 2 weeks overdue with her first child I would pick her up from Rollright and storm back to where we lived in Bloxham in an attempt to induce her! Did hear tell of a driver on the Birmingham-London service being passed by a fully freighted Kew Dodge. This shot was taken in June 2010 at the BaMMOT Museum at Wythall. The beautifully restored example of 45 originally built represents the first post-war coaches introduced by BMMO at their Carlyle works with bodywork by Duple. Based on the service bus (S6) with underfloor engine they were years ahead of their normal control – and half-cab – competitors. 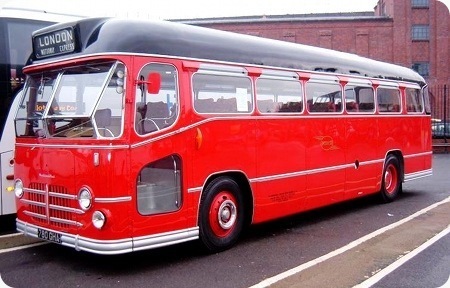 Twelve more, designated C2, appeared in 1950– modifications included an outward opening passenger door (replacing sliding) and reduced seating capacity to 26 to cater for the very popular extended tours. These vehicles gave stirling service and, even though larger coaches had been introduced in the mid 50’s, a number were retained for ‘coach cruises’ where narrower and shorter vehicles were required, Devon, Cornwall and the Scottish Highlands, for instance. A number survived well into the mid 1960’s. Even after their revenue earning life a number of these were converted to dual-control and became driver training vehicles into 1970. Thank you, Nigel, for bringing this beautiful beast to our attention. Another fine example of the industry-leading designs from the Midland Red stable. These C1’s, and the subsequent C2’s with their widely-spaced seating, must have been a delight to ride in. Spurred on by this photo, I have just visited the BaMMOT museum website and note that this coach is not on their rosta. Is it under private ownership? Yes Paul, this vehicle has been in private ownership for many years – the same family I believe – and is, fortunately for us all, a regular rally visitor in many parts of the country. You and other contributors might like to know there is a ‘Midland Red Day’ in October at the BaMMOT, when I am sure this icon will be present. From past experience well worth a visit! A number of people now have shares in this vehicle. I saw it earlier this year under repair with panels off etc so don’t know when it will be back on the road, but a favourite wherever it goes. Thanks, Nigel – I also noticed this event and checked my diary. To my horror, I realised that I had only just booked a 2-day theatre trip for myself, wife and mother-in-law for that very weekend, so it would be suicide if I cancelled – especially for "mere buses"! Ho hum! Next year perhaps? The vehicle repairs are not estimated to be completed before end Dec 2012 and will therefore not be at Wythall on Oct 14. The Group who own it are about 8 persons strong. What a very pleasant surprise to see a posting from you Roger. I am hoping your beautiful C5 (which I have submitted for a future posting) will be at Wythall when I make my ‘pilgrimage’ from Yorkshire in October – may even be able to take a ‘peek’ inside?. Thanks for the update on 3301. Nigel mentions the twelve successors to the C1 with Duple C26C bodies for extended tour work. Here is 3353, KHA 353, of the C2 class in May 1970 during the HCVC Brighton Rally. I cannot find any current record of this coach. Does it still exist? C5 is unlikely to be there either as it is off by rotation ie when you have 18 roadworthy vehicles only a few are on the road at the same time. This was on the road until Sept 2011. If I have few problems then with everything else it might appear. The innovation of these buses was great the first heavy vehicle I had seen with disc brakes and not drums you couldn’t wait to finish it so you could go for a road test up the Ayr Road, they were great to drive. "OH" how I miss those days when buses were buses and not the junk that they call buses today. 3352 stood for years in the drive of a house in Stanley Road Wakefield. It had the name Ronny Storm presumably a kind of pop group. A dignified old lady – still looks amazing even when in pieces, long may she live! 3353 was burnt out many years ago, I remember as a small lad I saw it in a yard (farm?) near Cannock with only below window line left. The coach was owned by the 3301 preservation group for spares. It went awol ie pinched by some scrappy about 30 odd years ago. 3352 is in a very bad way, the ribs of the body are all in steel & perished from water ingress so all require replacing, the floor is rotten & half removed. I haven’t worked on it for 10 years & I know nothing will have happened since. Perhaps when it gets passed on it will see the road again. Certainly not with Alan owning it. Kens shot of 3301 under repair (above) took me down memory lane. I did my apprenticeship at Bulwark Workshop In the 1960s. I now live in Melbourne Australia. Keep up the good work. Many fond memories of this old bus happy hours polishing the grill happy days at rallies across the country my greatest thanks to her old owners Allan, Cliff & Les for letting me ride along so happy to see she is being looked after still may be I get to see her again one day, fond memories. I remember taking my drivers test in this bus in the 1970s I already held a full PSV licence having driven on Walsall transport for a number of years. Even then you had to pass the Midland Red test. When you had passed you felt on top of the world.